Tuition is $6,995 when paid up front for the 3-year training. We offer options to spread tuition over the three training years. 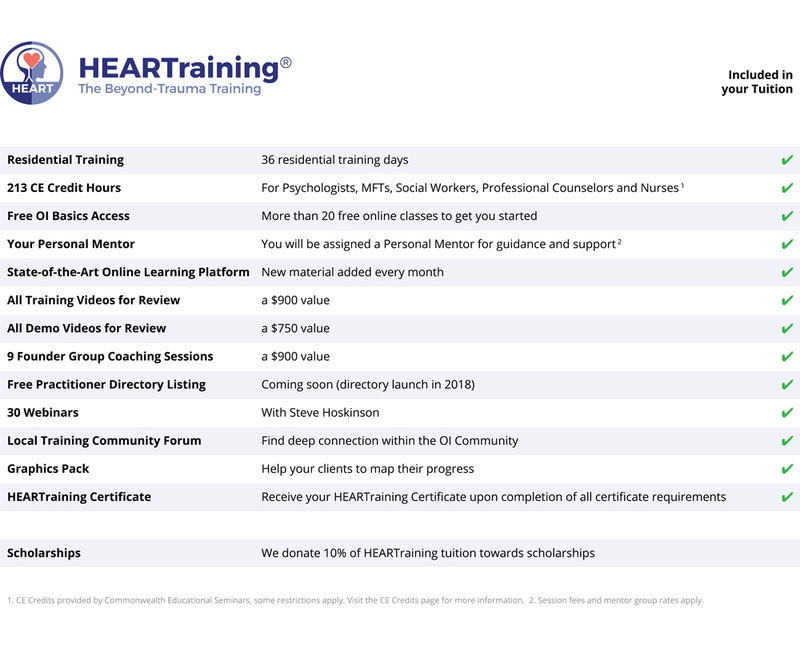 This page reflects tuition for HEARTraining® taking place within the USA. ** Tuition may vary in other countries and currencies. Please visit our Retreat Schedule for all international rates. *If you attend a HEARTraining with year 1&2 conducted in 4-day modules, your tuition per module will be $865 when paid up to 45 days before the start of each module. **International HEARTraining tuition fees may vary. Please contact your local coordinator for more information. Upon completion of all requirements of the 3-year HEARTraining you will receive your OI HEART Certificate and your OI HEART Graduate title and a badge to use on your website and business cards. Not included in tuition: travel, lodging, meals, retreat facility fees, session fees, and mentor group rates. Students traveling to the U.S. for HEARTraining may need special visas and documentation. Please contact us if you need help with a verification letter. An important aspect of the success of the HEARTraining is the residential retreat format, providing a container of safety and support, creating community, and providing a powerful environment for all students in which a selfless, heart-oriented path is found and nurtured. Please visit the Retreat Schedule and select the training page for the location of your choice for detailed information about lodging, meals, and retreat facility fees. Personal and Coaching Sessions are charged at a fixed rate during the Residential training units. This rate will be established locally based on regional market variations and may vary by country and region. As a guideline, in the USA, the average rate for sessions is $125. We will work with all students who are experiencing financial need to help them obtain an appropriate session rate before signing up for sessions at the Residential training units. Each Mentor is committed to providing a minimum of one session at a reduced rate per Residential training unit. Mentor Group Meetings are $45 for each 1–1.25 hour meeting, which take place online between Residential trainings. See our Requirements for more details before you enroll. A complete Sales, Cancellation, Refund and Transfer Policy can be found on the Policy page. Group discounts and scholarships are available for those from traditionally marginalized populations. For more information and questions on financial assistance please contact Tashia at +1 (760) 634-3691, or tashia@organicIntelligence.org. Certain restrictions apply. If two or more people from the same household or family want to enroll in the HEARTraining, please contact Tashia at +1 (760) 634-3691, or tashia@organicintelligence.org for details. We offer a 25% discount for the second household member. Certain restrictions apply. If you have completed Somatic Experiencing, Sensorimotor, Hakomi, or you are a Somatic Psychology, Somatic Psychotherapy, or Body Psychotherapy graduate from CIIS, Naropa, Prescott College, or JFK University, you are eligible to receive a 33% discount on OI HEART tuition. A copy of your graduation certificate will be required. 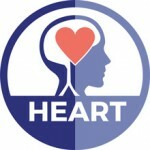 If you have completed part of Somatic Experiencing, Sensorimotor, or Hakomi you are eligible to receive a partial discount on OI HEART tuition. A copy of your certificate of completion for the last somatic training module you attended will be required. The discount will be calculated based on the number of somatic training days you completed in a previous training program. The HEARTraining has a significant experiential component. All students start with Retreat 1 and proceed through each successive HEARTraining module in sequence — no “advanced placement” is available. If you believe you may qualify for any of these discounts, please contact Tashia at +1 (760) 634-3691, or tashia@organicIntelligence.org before enrolling. 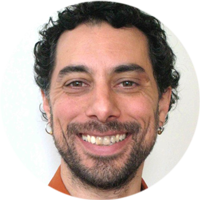 Organic Intelligence is an elegant approach to healing and the cultivation of resilience rooted in principles of mindfulness, and kindness for ourselves and others. OI integrates tools of skillful attention and heart-centered practice and is a deep support for meditation and spiritual inquiry. OI works to restore natural equanimity and an open, responsive presence through which to meet changing experience. With this restoration, the heart and body are more able to rest at ease, available for meditation, relationship, and challenge when it comes.